Director Nancy Meyers is well known for her work in Father of the Bride, The Holiday, What Women Want, Something Gotta Give and It’s Complicated. She has the beautiful talent of mixing the older actors with the younger ones and delivers a social message. This time she chooses Robert De Niro and Anne Hathaway for the film “The Intern”. The story is about a young rising businesswoman Jules Ostin (Anne Hathaway) who is running a successful online clothing store. Her business partner recommends that she start a Senior Internship programme because the e-commerce business is growing fast and venture capitalists are interested in funding but need a corporate social responsibility to come into the scene. Here w meet Ben Whitaker (Robert De Niro) who is a 70-year-old widower but has years of experience running as Vice President of Sales and Marketing with a phone book company. Ben is loved by Jules staff and lo behold he has to shadow Jules. This obsessive young mother has her world falling apart and it takes Ben to show her that. He is also the ones, who help her pick up the pieces, learn valuable lessons in business and her broken marriage. Thus, Nancy Meyers is asking can women be successful businesspersons? Ben thinks so and he encourages Jules to be herself and proud of whom she is and what she has done and what she can still accomplish. 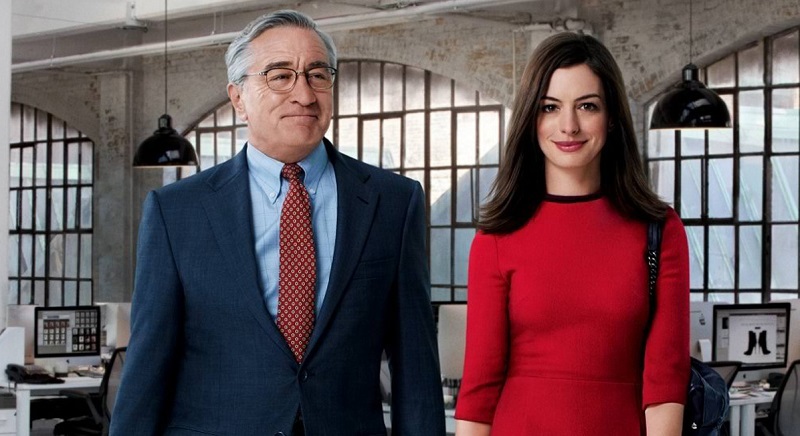 The Intern is a definite watch for a quiet day and if you love Robert De Niro he is simply great. Anne Hathaway has definitely matured in her acting and while this film is breaking records, it is lovely to see her performance. Enjoy The Intern, it is also incidentally a super example to show women empowerment.